You have the option to use EchoSpan's standard Group Report template and/or create and customize your own. Follow to steps below to create a custom Group Report template. 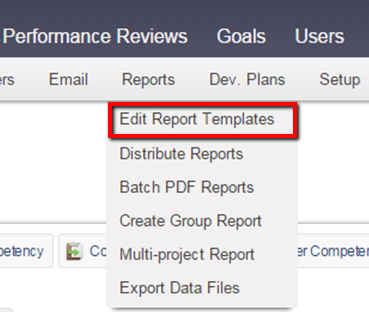 From the drop-down menu, select Reports>> Edit Report Templates. Click the "Create a New Template" button at the top of the page. Enter a title for your Group Report template. Start with a blank report template (A new report template will be created with the cover page component only). Duplicate the current report template (The template that is currently open for editing on your screen will be duplicated). Duplicate the template below (Allows you to select one of your current templates from a drop down). Select the Report Type as “Group Report”. Click the "Submit" button and your template will be opened to allow for editing.